Medical plant(Canangium odoratum)for the botanical name is a large trunked plants up to 0.1 to 0.7 meters in diameter decades of age. Plants have memories stem fragile (easily broken) in his youth. Height of this tree can reach 50-20 meters. 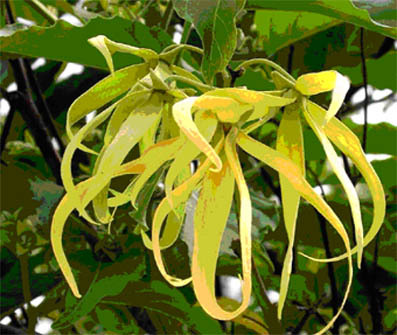 Ylang flowers will appear on the trunk or branches of trees above a particular arrangement of flowers. A ylang flower consists of 6 pieces of leaves with a yellow crown and comes with 3 pieces of green leaves. The composition of compound interest with a fork. Ylang scented flowers and distinctive. In the countryside, often maintained to be taken ylang flowers. Wild medical plant which are now beginning this rarely easy to grow in low-lying areas starting altitude of 25-1000 meters above sea level. Ingredients: 3 ylang flowers that have been dried. Method: brewed with 1 cup hot water and sealed. How to use: filtered and taken regularly. Ingredients: ½ gemggam ylang flowers and 1 ½ tablespoons white sugar.